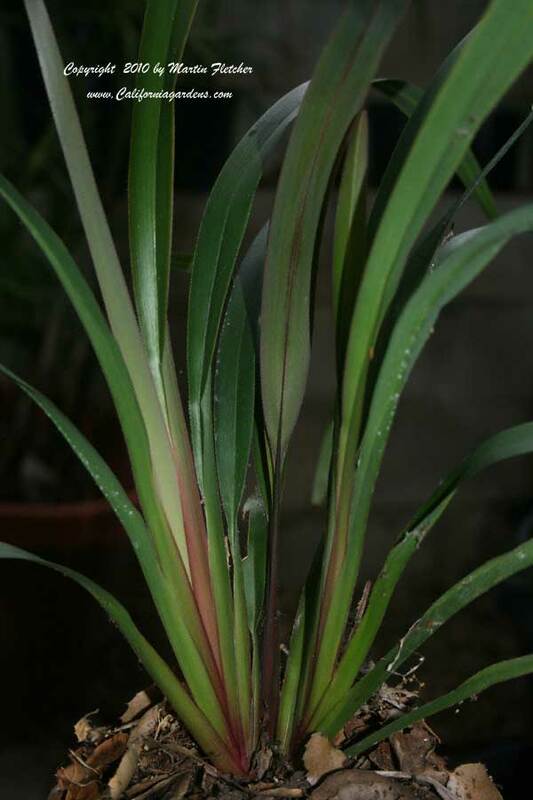 Compared to the straight species Dianella Tas Red has broader leaves and more red at the base of the new leaves. Dianella Tas Red is a great plant for the dry shade garden. The plants are drought tolerant enough that they hang in there even if there is no supplemental water in our inland valley location. Dianella Tas Red foliage grows 12-18" tall and wide, the blue flowers and metallic blue fruits can stand up to a foot above the foliage. Dianella Tas Red tends to burn in the full sun and will flower even in dense shade plantings. Dianella Tas Red is easily hardy into the low teens and likely below. Red new foliage of Dianella Tas Red - Flax Lily. High resolution photos are part of our garden image collection.